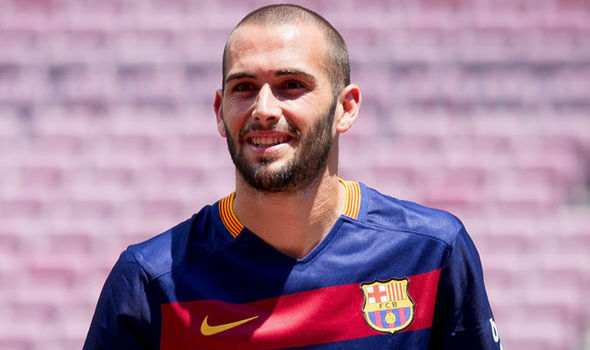 Aleix Vidal going to move from Barcelona in winter transfer windows. According to report the former Sevilla midfielder was failed to prove himself against Alaves and his disappointment has forced him to through out from the Nou Camp. After defeating against Alaves Barca boss Luis Enrique took instant decision to change entire setup for next match. Actually by switching the players he wanted to avoid the situation which created against Alaves. Luis immediately cut out the name of two bad performer of the game whose are none other than Aleix Vidal and Denis Suarez. The goalscorer Jeremy Mathieu was also thrown out from the La Liga squad. According to source Barca is planning to send him out of loan or sale permanently. They also set target for the replacement of the right back. Arsenal defender Hector Bellerin became the first choice for the post. Barca director Robert Fernandez and Head coach Luis Enrique have recently decided to cast the the 21 year Spanish international in their side. He became the winter transfer target of Nou Camp. After moving Dani Alves in this summer, the Catalan giant needs a tough defender who has the ability of protest all attack of opposition. That’s why they are so desperate to replace Vidal. Vidal left Sevilla in 2015 and joined Barcelona for an €18 million transfer fee. In Nou Camp he could not chance to play regular and bench system almost dismissed his career. He spent a long time without playing. This way his career going to be down. So the right back is also keen to leave the side as soon as possible. Most of the Barca fans thought that the transfer will be the right decision. Vidal was too amazing when he was at Sevilla. He was not only a strong right-back but also a good winger. He was too good at his position but Unai Emery converted him from playmaker to defender. Actually they wanted to replace Dani Alves with him. But the plan got change suddenly and Alves contract has expanded by one more year. And Aleix unable to make debut that year in Catalan. Recently he posted on twitter that to continue when anyone though that he could anymore is what makes the difference between he and the rest. Life is not about setbacks but not giving up no matter how big the setback. By the state of the report Inter Milan and Napoli both are interested to cast the midfielder in their side. Luis Enrique yet not comment or that.